Julyssa: So shall we get started with our chat? Julyssa: You mean to say “how the hell you turned me in to a Sherlock fangirl and brainwashed me“? :P Naw, let’s get down to the dirty business: is BBC Sherlock gay or not? Julyssa: Yet the fangirls are eating it up! Julyssa: I mean, I can see a connection between them, but it’s not like I think they are romantically involved. There’s something deep there, but I believe it to be two lonely souls finding an interesting friendship. Julyssa: Irene is gay? Like really? I mean, isn’t’ she hot for Sherry? Julyssa: She did? I think I was too busy trying not to chew through my pillow during that episode. That is one of my fav episodes!!! Guuh Why were people angry about that? About the topic. 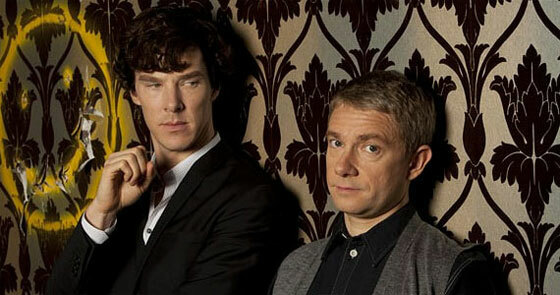 I think Sherlock is asexual… But he can help.falling in love with John. Homoromantic quite possibly. He never thought find someone like John so when he found him was a earthquake in his world. In John‘s case… Well, yes, he’s heterosexual. Welp, maybe put these labels on them is absurd, ‘cause finnally you can’t say “love him/her“. And I think that’s what they experimented. They just know that they can’t be separated frorm the other, THEY CAN’T. It would be terrible if something like tha happens. @Hana Black, So you agree with me XD And that’s what I cannot wait for Series 3 to begin! I want to know what the time appart did to then. And I totally want John to punch Sherlock… and the hug him. @mirella, Yes. I agree. And I want to see series 3 so badly! I’m not patient, at all. Heck yeah, punch and hug. Wanna see what says Sherlock to him. Wanna see how even after that they still fit together naturally. God, love ‘em. I don’t think that Sherry is so in love with John, more that he really cares for him because he is kind of his first friend.